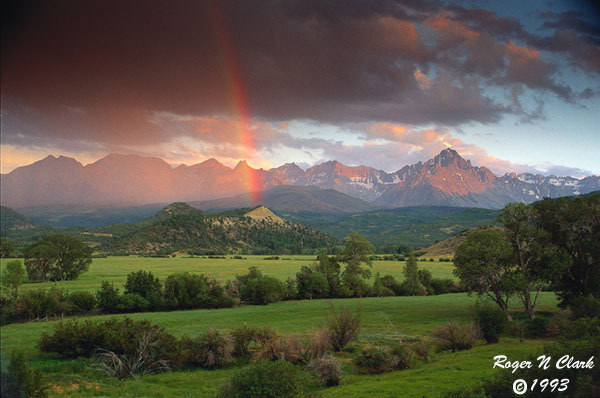 This is an image of a rainbow at sunset in the San Juan mountains of Colorado. 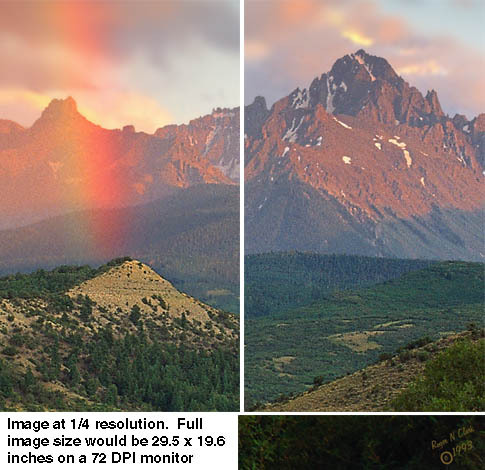 The view of these mountains is spectacular at any time, but this rare sunset rainbow view is unusual. The highest mountain is Mount Sneffles, 14,150 feet, located to the right of center. This image won Best of Show in the 1993 U. S. Geological Survey National Photography Contest. It also won first place in the nature category. The 35mm image was scanned at 6000 dpi (137 MByte digital file) and produces stunning 19 x 29 inch prints. The image below shows the some of the detail visible in such an enlargement. The image appears about the size of a print approximately 20 x 30 inches in size, but a print would appear about 4 times sharper with more detail. Prints are signed in a small size in the corner and in a color that does not detract from the image, like that shown below.